Find out which RNA-tinkering biotech stock looks most attractive right now. Whatever your political leanings might be, you can't deny Hillary Clinton's influence on biotech stocks. The presidential candidate's expression of outrage over EpiPen price hikes carried over to the biotech industry, knocking the iShares Nasdaq Biotechnology index down a couple of points recently. Biotechs without products to sell yet were hit harder than most, and RNA-based therapy pioneers Alnylam Pharmaceuticals, Inc. (NASDAQ:ALNY) and Ionis Pharmaceuticals (NASDAQ:IONS) gave up some recent gains, as they were tossed in with their peers. 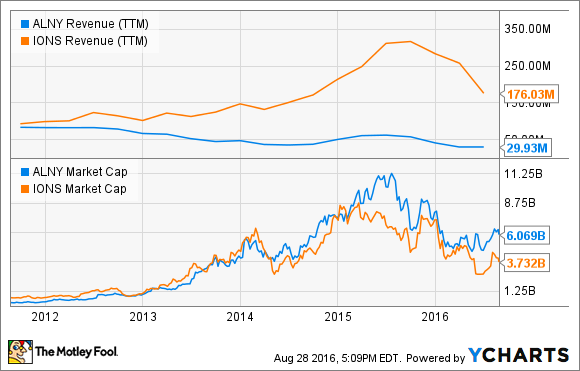 In light of recent price movements, let's take a closer look at both biotechs to see which is more attractive right now. Discovering new drugs isn't a job for the faint of heart. Generally, thousands of potential new drugs never take the step from petri dishes to costly animal testing. A precious few perform well enough in animal models to justify even more costly human (i.e. clinical) studies. Alnylam and Ionis have an interesting edge over the industry as a whole in this respect. Diseases caused by known genetic mutations that lead to abnormal protein production make surprisingly easy targets for both companies. Once you know the faulty sequence of nucleotides you want to disrupt, creating a complementary strand is relatively straightforward. In a nutshell, both companies deliver complementary RNA strands that intercept messenger RNA (mRNA) strands transcribed from faulty genes before they reach ribosomes, where they would otherwise be translated into proteins with a dysfunctional amino acid sequence. The biggest difference in their approaches approaches is that Ionis' RNA antisense drugs are degraded along with faulty mRNA strands they bind to. Alnylam's small interfering RNA strands are unharmed during the mRNA degradation process, which suggests increased activity at lower doses. Both companies are developing a therapies to treat nerve and heart damage caused by faulty transthyretin genes. Alnylam's lead candidate, patisiran for treatment of nerve damage, showed promise in phase 2 earlier this summer. After 24 months, patients receiving patisiran showed an average decrease of 6.7 points on a standard neuropathy impairment test, which is a vast improvement over the historical average increase of 26-30 points observed in untreated patients. A phase 3 trial designed to support a new drug application is fully enrolled, with a data readout expected about halfway through next year. If patients in the placebo control arm perform in line with historical observations, the trial should be a slam dunk. If successful, Alnylam could begin generating sales (expected to peak at about $1 billion annually), with its first commercial-stage drug in 2018. Ionis Pharmaceuticals, partnered with Biogen, is also barreling toward the finish line with a treatment for the largest genetic cause of infant mortality in the U.S. -- spinal muscular atrophy. Nusinersen hit its main goal early, showing that infants treated with a single injection showed significantly improved motor-skill development compared with patients injected with a placebo. Biogen exercised its option to develop and commercialize nusinersen worldwide, triggering a $75 million payment to Ionis. If approved, Ionis will receive another $60 million from Biogen and tiered royalties on all sales of the drug that could reach the mid-teens. With peak sales estimates of around $1.7 billion, nusinersin could generate a great deal of high-margin revenue for Ionis. Ionis' commercial-stage track record is limited but disturbing. The biotech earned approval years ago for its first drug, Kynamro, for treatment of rare genetic hypercholesterolemia, but it flopped. There may be a silver lining for Kynamro. Ionis' partner, Sanofi, recently returned its rights to Ionis, which subsequently sold them to Kastle Therapeutics for $15 million up front, a 10% equity stake in Kastle, and potential royalties in the low to mid-teens on Kynamro sales. The relative safety of Ionis' RNA antisense drugs compared with Alnylam's interference approach is a matter of contention, for good reason. Earlier this year, Ionis' transthyretin associated nerve-damage candidate, IONIS-TTRRx, was racing with patisiran toward the finish line, until safety concerns led its partner, GlaxoSmithKline, to shelve a phase 3 trial until more safety data becomes available. One thing Ionis has in its favor is a much larger stable of clinical-stage candidates partnered with deep-pocketed drugmakers. As its candidates jump through regulatory hoops, predetermined milestone payments from its partners have been substantial, although the payments have tapered off in recent quarters. Alnylam has fewer shots on goal, and in turn less partnership revenue. This increases development risks but could lead to a larger share of profits if unpartnered candidates succeed. Ahead of nusinersen's early success, I might have chosen Alnylam as the better buy based on patisiran's strong probability of succeeding in phase 3 and then launching ahead of a potential competitor from partners Glaxo and Ionis. In light of nusinersen's phase 3 success, robust pipeline, and a much lower market cap, though, I have to call Ionis the better buy right now.